Poaching is one of the best ways to cook scallops, shrimp, and many types of lean fish. The gentle, even heat provided by simmering can cook seafood in a few minutes. And because the seafood is surrounded by liquid, there’s less danger that it will dry out. Knowing how to poach seafood is essential for many recipes. Today, we focus specifically on how to achieve a perfectly poached scallop. We’ll need poached scallops for a dish we’ll be discussing later this week. Scallops are shellfish found throughout the world. Most scallops are wild-caught, although they are beginning to be commercially farmed. Scallops come in several varieties. You can find sea scallops (the big ones) in most markets. Bay scallops are smaller, more seasonal, and quite expensive. Calico scallops are similar in size to bay scallops, but much more plentiful — and hence less expensive. Calicos sometimes are marketed as bay scallops. So unless I know for sure that the “bay” scallops in my market are not calicos in disguise, I usually buy sea scallops. For much more information about scallops, I recommend James Peterson’s Fish and Shellfish or Julia Child’s The Way to Cook. When I serve scallops as an appetizer, I usually figure on 2½ to 3 ounces per person. For a main course, I serve or 4 to 6 ounces per person. This recipe is sized to serve four people as an appetizer or two as a main course. It was adapted from Julia Child’s The Way to Cook. Peel and finely mince shallots. Add to small saucepan (2-quart or smaller). Add vermouth, ¼ cup water, and salt. Put on stovetop, bring to a simmer. Simmer for 5 - 10 minutes to develop flavor. Meanwhile, briefly wash the scallops under running water. Many scallops have a little nub on the side, which I remove (it tends to get tough when cooked, which can be unpleasant). If your scallops are very large, you may want to quarter them (or slice into rounds) for more even cooking. Add scallops to the shallot and vermouth mixture. The liquid should almost cover the scallops (the tops of the scallops will be poking above the liquid level, which is OK). Add some additional water if necessary, return liquid to a simmer, and cover the pan. 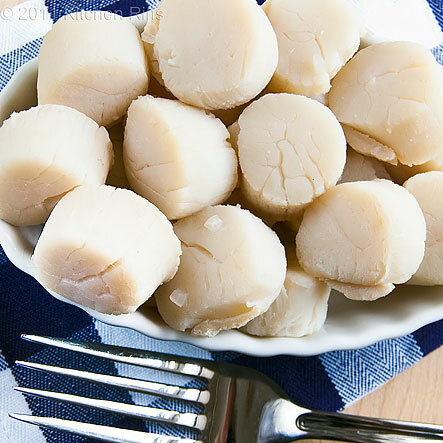 At this point, large sea scallops will take 1½ - 2 minutes to cook (scallops are done when you poke them and they are somewhat firm, but will yield to your finger and then spring back to shape when you remove your finger). If you’ve quartered your scallops, simmer for just 20 - 30 seconds, until they’re what Julia Child calls “lightly springy.” If your scallops are smaller still (calico scallops), they may be done by the time the liquid returns to a simmer (or will take just a few seconds more at most). Remove pan from heat and let scallops rest in liquid for a few minutes (10 or more) to absorb the shallot-and-vermouth flavor. If you want to eat the scallops plain, you can serve now. Otherwise, proceed with whatever recipe you are using. 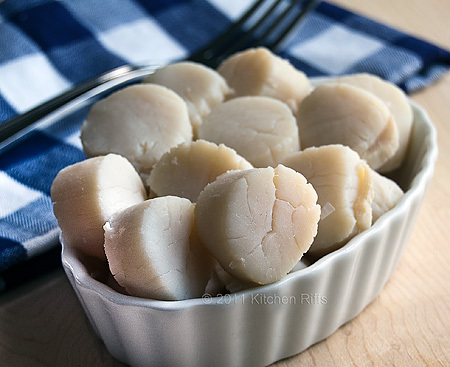 You can cook scallops ahead of time and store them in their poaching liquid in the refrigerator (put them in an airtight container). If you prepare them ahead, drain them and then, if serving warm, heat them in whatever sauce you’ll be using for your recipe. Alternatively, you can bring the poaching liquid to a simmer and briefly immerse the scallops in that until they’re warm through – just a few seconds. Poached scallops are also tasty served cold. You can substitute ¾ cup of dry white wine for the vermouth and water. For seafood cookery, I suggest a Muscadet, but any dry white wine works well. This recipe can easily be doubled (or tripled). If you double the recipe, increase the amount of vermouth to about 2/3 cup, and the water to ½ cup. Although you can eat poached scallops as-is, they’re usually served with some type of sauce. When served warm, they go well with a beurre blanc or hollandaise sauce. When served cold or at room temperature, they’re delicious with a vinaigrette sauce. In fact, that’s how we’ll be using them later this week, when I will post a recipe for Poached Scallops on Artichoke Scoops with Mustard Vinaigrette.